The clubs annual fun flyin will be held at the end of July 2019. 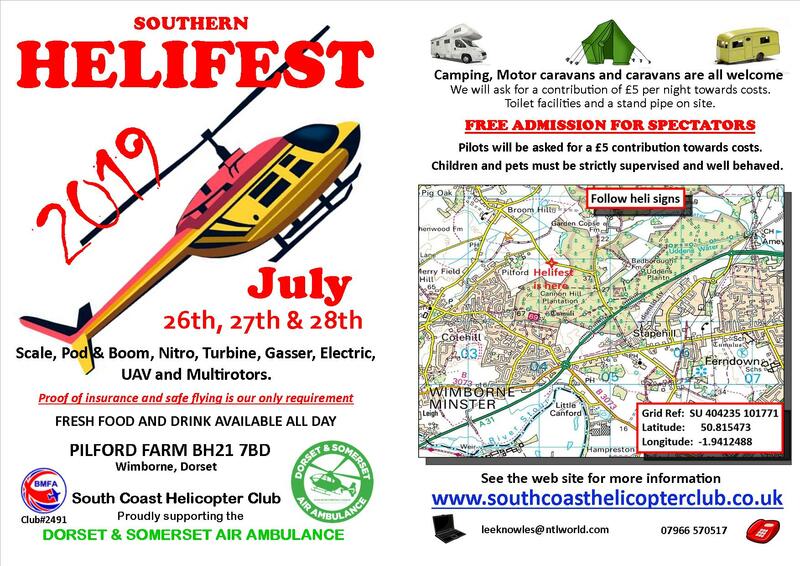 We are very grateful to the following organisations and companies for their support of SCHC Helifest 2019. Some notes of guidance and information for you. Pilots briefing will be at 10am each day. On Sunday, after pilots briefing to around 4pm. Extended flying on Saturday evening but only for electric models. If you arrive late or miss the pilots briefing then you need to see me or Lee before you fly. If you are flying FPV then you MUST have a spotter with you. NO flying if you have taken alcohol! Due to the condition of the field, NO fires or individual BBQ’s will be aloud. Safety is critical over the weekend, if you are seen flying in an unsafe manner or in a ‘no fly zone’ you will be asked to stop flying. We will be running our BBQ each day and drink will available at a modest cost. Please bring along you own food and drink, the club will supply snacks and salad. We look forward to be seeing you for what we hope will be a great weekend of flying. If you have any questions, please email me or contact me on 07840 528933.